Ping pong fans from across Nottingham can test their dexterity and skills during a unique challenge at the city’s leading entertainment venue. Taking place at Alea on Upper Parliament Street those who take on the challenge will be able to test the speed of their reactions and skills with a bat against what has been billed the most ruthless player ever to take up the game – the Tsingtao Dragon! 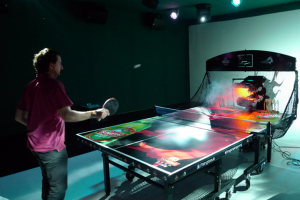 A fire-breathing, ball-shooting robot, fans of the game who pop along to the popular night spot on 13 and 14 January are being guaranteed the most thrilling game of ping pong they’ll ever play. Part of the venue’s Chinese New Year celebrations, players will be able to play against the Dragon as a team or as an individual and is hoped will encourage more people to take up the sport. Rebecca Deaville, marketing manager at Alea said: “Ping pong or table tennis is a great sport to either watch or take part in. Not only is it an Olympic sport but it is the most popular racquet sport in the world and is ranked second overall in terms of participation. “It is also one of the most widely played games in China so is a great way to build towards our own Chinese New Year Celebrations. “If there are any ping pong clubs out there then we want them to come along to give it a go. Alternatively those looking for a bit of a fun night out will find this the ideal place to be.